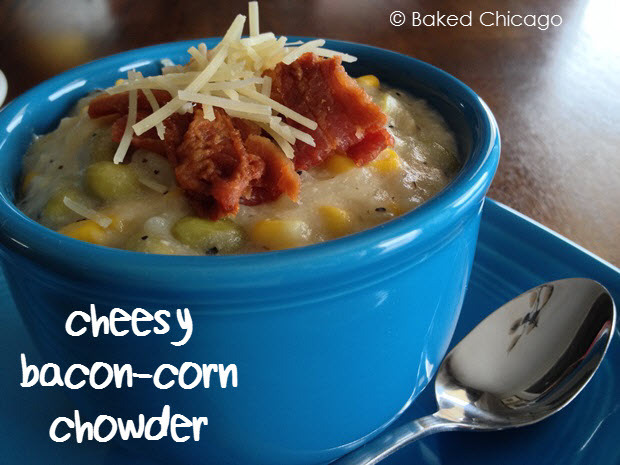 Home » Soups, Salads & Sides » Give Old Man Winter a smack down with Cheesy Bacon-Corn Chowder with Edamame! Given how bitterly cold it has been, my slow cooker is getting a solid workout this winter. And that’s okay. I find it to be therapeutic to have comfort food (especially soups) simmering in the slow cooker, filling up the house with a delicious, familiar smell. You’ve probably noticed that I use edamame (green, baby soybeans) in a lot of recipes. I love edamame, and dare I say it’s probably my favorite vegetable. And it’s good for you. Until a few years ago, I would have said potatoes or corn are my favorite vegetables. I still love them, but they rank a bit lower on the “good for you” chart. I’ve been wanting to create a soup recipe that would be improved with the addition of the edamame. So I took inspiration from one of my favorite canned soups (chicken corn chowder) and decided to go vegetarian and amp it up with the edamame. I was really pleased with the results. 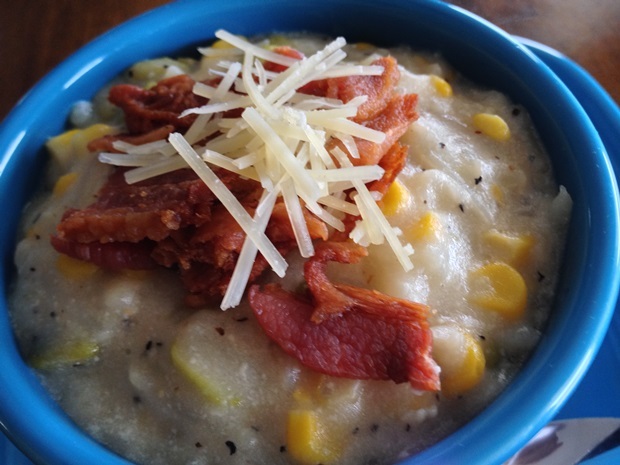 What makes this cheesy bacon-corn chowder so satisfying isn’t the edamame alone. It’s also the bacon and cheese! Using a large slow cooker, add and stir together the corn, potatoes and edamame. Add the chicken broth, chopped onion, salt and pepper. At this point, you’re going to cover the pot and cook on HIGH for about 2 hours. Watch for when the chowder begins to boil. At this point, you’ll add the milk and cheese. Stir to incorporate and cover again, letting it cook for about 30 minutes or until the cheese melts completely. Stir the ingredients until blended. I like a thick chowder, so I added a beurre manie (pronounced BURR-mahn-YAY), which is essentially a paste made by kneading together equal portions of flour and softened butter. A beurre manie is similar to a roux, except it’s not cooked. In a small bowl, knead together the butter and flour. Add about half of it to the chowder mixture and stir gently. Watch the consistency and add the remaining beurre manie, if needed, to thicken the chowder. Let it cook for about 20 minutes before serving. Thick-cut bacon is one of my all-time favorites and my current favorite thick-cut bacon is from Patrick Cudahy. You can actually taste the smoked applewood when you bite into it. 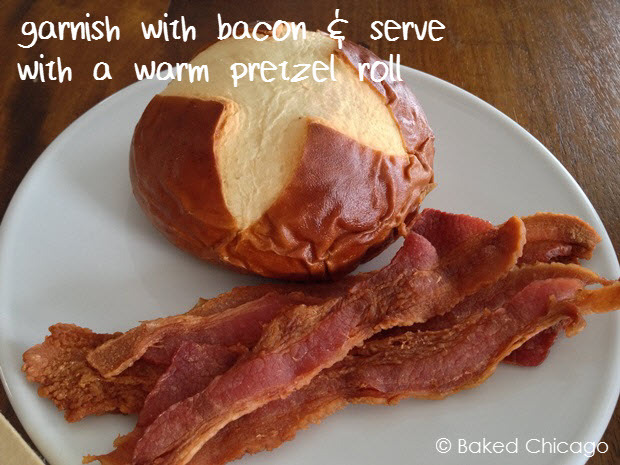 It’s totally bacon heaven! You can incorporate the crumbled bacon into the chowder. I recommend no more than 15 minutes before you are going to serve it, so it stays on the crunchy side. I like to garnish a bowl with a bit of crumbled bacon for extra texture, along with the fresh shredded Parmesan. Cheesy bacon-corn chowder freezes well, so be sure to put a few servings in your freezer to enjoy the next time we have another polar plunge – which at this rate will probably be in early February! Using a 4-quart or 6-quart slow cooker, stir together corn, potatoes and edamame. Add chicken broth, chopped onion, salt and pepper. Cover and cook on HIGH for 2 to 3 hours. As soon as chowder begins to boil, add the milk and cubed cheese. Stir and cover for about 20 to 30 minutes, or until cheese melts completely. Stir ingredients until blended. Serve warm by the bowlful. Garnish with shredded Parmesan cheese, if desired.